Fighting Cancer, Hope, Jihad on Drugs™, Vested Interests, Vote Wikiriwhi! Now I appreciate the use of Cannabis is a sensitive topic to many people, yet to my thinking if Cancer is threatening to take away My life, or the lives of my friends or Family I would be willing to seriously look into the claims that Cannabis/ Cannabis Oil cures some types of Cancer… irrespective of the Petty Legal issues involved. I post this today to inform and embolden Patients and Parents of sick children, not to allow them to miss out on a potential cure simply out of a misguided obedience to Bad Laws. Even if you believe Prohibition is right, let me share the fact with you that there is a Massive movement going on to legalise medicinal Marijuana and thousands of Claims that Cannabis can cure some types of Cancer. Add to this the vast history of cannabis as a medicine, and realise that Prohibition is a very modern anomaly, based upon very poor reason, and falsehoods. I would like to inform you that though the Powers that be… the FDA etc deny Cannabis has any medicinal qualities… the Big Pharm/US government holds patents on Medical marijuana! There is a strong belief that it is not just the bigotry of mainstream medicine to alternative treatments which keep Medical marijuana Illegal in most western nations, by the Mega Pharmaceutical Companies whom make trillions of dollars from their own Chemical factories. Thus they seek to maintain a phobia against cannabis so as to keep it from competing with their poisons in the market place. I have personally herd testimonies of Cancer survivors who say that Taking cannabis helped the survive the ravages of Chemotherapy. One man told me he was in a very bad way from the Chemo and cancer, and simply could not eat until he started using cannabis to stimulate his appetite. He credits his survival to Cannabis. It is because of stories like this… and there are thousands of them, that I write this blog post for those whom seek ways in which they can help themselves or their loved ones suffering the evil of Cancer. 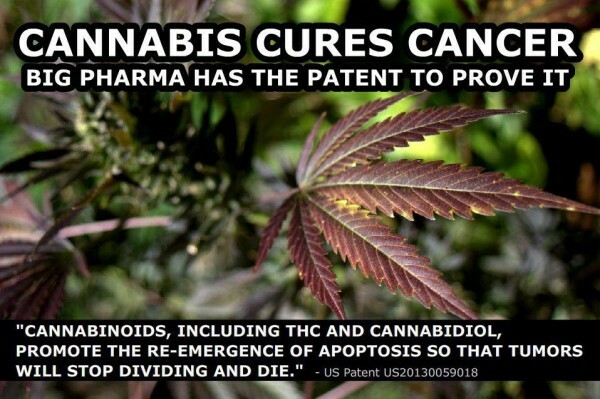 I suggest people Google ‘Cannabis cures Cancer’ and inform yourselves about what is going on out there. Note: One skeptic wrote… “I am skeptical. Why (in the link to her gofundme.com) given, does she have short hair? Cannabis cures Cancers said: ” The recommended dose for all internal cancers is to eat at least 2/3rds of a gram of high-THC Cannabis oil per day. Debra Cooper: In 2011 my husband was diagnosed with Chronic Lymphocytic Leukemia (CLL). At that time his lymphocyte count was about 48,000 and it stayed around there for about a year and a half, then on Jan. 25th 2013 his count was up to 78,000 and his oncologist started talking about chemo if it reached 90,000. At that time the only prescribed medication he was taking was Trazodone, a mild sedative to aid with sleep. I was desperate to help him. Then I found HOPE! 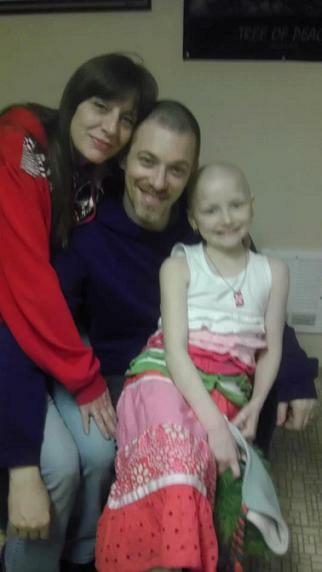 I saw a news report about a 7 year old girl with Leukemia, Brave Mykayla. Oregon’s youngest Medical Marijuana Patient. She was taking Cannabis Oil and it was working! Google is a wonderful tool my searching led me to Rick Simpson’s video Run From The Cure. And here we are . . . (like I said I was desperate) as of Feb. 25th 2013, Rick Simpson Oil (that I make per Rick’s instructions) has made my husband’s lymphocyte count drop to 38,000. That’s the lowest it has been since he was told he had Leukemia in 2011! His Dr. is no longer talking about chemo. But he wants to monitor blood work every 6 weeks, which we welcome. My husband started ingesting the RSO (per Rick’s dosing instructions) on Feb. 3rd 2013 in gel caps 3 times a day as he doesn’t like the taste of the oil. He only took the Trazodone the first night and then could not go to work in the morning so he stopped taking them. He sleeps so well now he no longer needs them at all. His lymphocyte count dropped 40,000 his Dr. wouldn’t say it was the RSO that lowered his count but I know that it is. The only other things he did different was bounce 20 mins. a day on a small trampoline and eat Rick’s high alkaline diet suggestions no meat, no sugar, no dairy and at least a gallon of alkaline water a day. I do cook his food with cannabis infused extra virgin olive oil and cannabis infused coconut oil, and he eats a lot of flax and hemp seeds. He also started taking magnesium and a probiotic (otc). The Dr. would not confirm that diet changes were helping either. I have now increased his dose to 1 gram a day and he will stay at that dose for sixty days. He will then continue with a maintenance dose. My plan is to update here every 6 weeks after blood test results are in. Thank you Mykayla We love u! Previous PostJefferson’s God. The Rock upon which Liberty is founded. (God save us from Atheism! )Next PostWrite a letter, you’ll feel better! I am sharing this testimony to the world, because i am the most happiest person on this planet earth, first i thought i was going to die when i was told i was suffering from cancer of the lung, i did all i could but to no avail but thank God Dr obi akpo came to my rescue by providing me with cannabis oil and within some weeks i noticed great changes in my health and as i am writing this testimony i am completely heal. My name is Valentina from Canada , It is with pleasure that i thank Dr.Rick Simpson for saving my dying husband with his cannabis oil. After reading the cancer cannabis oil miracle cure in the clinic where I was admitted, I had to contact Mr. Rick Simpson on his email: ricksimpsonphoenixtearsoil@gmail.com in order to secure the medication and with fast responses from them, I eventually made order for the medication which arrive within 3 days of order. Thank’s for getting in touch Mathew and for sharing your personal testimony. I a very happy to hear that Cannabis has saved your life! Mathew Fred is a fake patient and Dr. Obi Akpo runs a scam. Don’t fall for it! 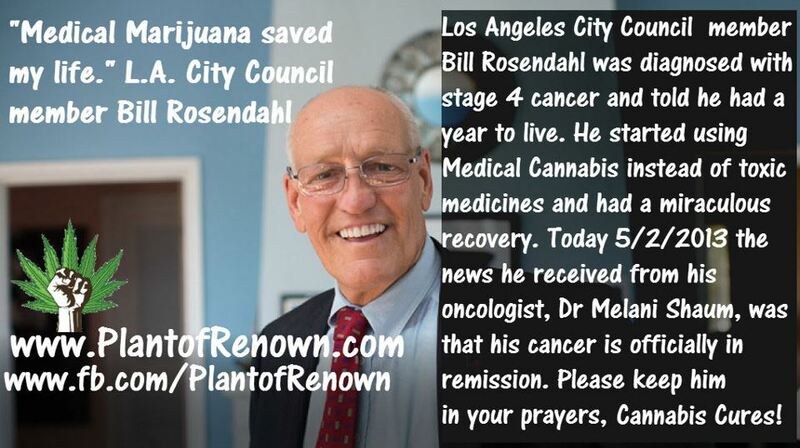 My husband had stage four lung cancer has been cured within the Rick Simpson Hemp oil. My husband has been through chemo 3 times, but this time his condition was getting worse that I was afraid it will kill him. When a friend of mine directed me to Rick Simpson at: rickcancercure@gmail.com where I could buy the medication from, because the Rick Simpson has help cured his own Brain tumor and I strongly recommend that he would helped me with my husband cancer and cure it completely, I never believed the story, but today, with thanks giving in my heart, My husband lungs cancer has been cured within the Rick Simpson hemp oil and I want you all to join hands in appreciation of the great work that is been done by rick Simpson, he is the man that saved the life of my husband with hemp oil, thanks to him. You can contact him through his email: rickcancercure@gmail.com I’ll keep thanking him because he is God sent to save my family that was at the stage of collapsing all because of my husband cancer. Your testimony is very helpful for other people. I pray your wife fully recovers. Contact cancer centre london via email: londoncancercentre@gmail.com to get your hemp oil for medication. My latest pet scan show a hundred percent victory over Lungs cancer and am so happy and rejoicing. I will Honor you for the rest of my life for ever being there for me. Thank you Sir. Hi, It is nice to inform you all that I have done Chemo and Radiation 2 times for my Breast. My battle with Breast cancer started 5 years ago, after so many Chemo, Radiation and other natural therapy treatment that i took just to cure my Breast cancer, it all didn’t work for my condition. I have been treating this disease for the past 5 years, but today i am here telling the world about my final victory over Breast cancer with the help of Rick Simpson Hemp and cannabis Oil that I bought from him.This is a breakthrough in my family with so much Joy in our life today, i do really appreciate all the help and contribution from every member of my family for all they did for me and much love to my caring and lovely husband Linus. My love, you gave me the strength. Let’s Stop Breast Cancer, Go for your test and save your life, but if you have any cancerous diseases, there is no need to waste money on Chemo or Radiation, go get your Rick Simpson medication today,this is a medication that should be legalize worldwide, for those who wish to purchase the medication, just contact Dr.Rick on:Ricksimpsoncancercure@outlook.com and you will also be told on how to apply it. experiencing Name:Dr Kelvin Moss email:(healthcare201@hotmail.com) ..Please don’t keep this opportunity to yourself tell the hold world and save more life out there thanks . I want people who are suffering from any kind of cancer to do research on cannabis oil and its effectiveness.i was diagnose of lung cancer May 12th 2013 and i have done surgeries for treatment and it did not work until i heard about cannabis oil and i decided to use it for treatment, i contacted the UK cancer research centre via their email ukcancerresearchcentre@gmail.com and the cannabis was delivered to me and i was informed by the research centre on how to use the cannabis oil for treatment,after using the oil for treatment for 90 days,i felt different then i went for to see the doctor and i was told that i am no longer suffering from cancer. I want people who are suferring from any kind of cancer to do research on cannabis oil and its effectiveness.i was diagnose of lung cancer May 12th 2013 and i have done surgeries for treatment and it did not work until i heard about cannabis oil and i decided to use it for treatment,i contacted the cancer centre London via their email londoncancercentre@gmail.com and the cannabis was delivered to me and i was informed by the research centre on how to use the cannabis oil for treatment,after using the oil for treatment for 90 days,i felt different then i went for to see the doctor and i was told that i am no longer suffering from cancer. My journey with breast cancer started in November 2004. I was devastated, scared and numb when I found out I had cancer. At the time, I was 48 and thought that I was healthy. I immediately started researching doctors and treatments. I found a surgeon near my home outside of Savannah, Georgia to remove the tumor. After the surgery, I consulted with a local oncologist and radiologist. The doctors were so impersonal. They didn’t want to listen to a word I was saying. They wanted to put me in one of those cookie-cutter scenarios. There were no other options for me. They just wanted to cut, radiate and do the chemo. I felt with the way they were conducting business, I had to get a second opinion. so we decided to try Rick Simpson hemp oil. we contacted Rick via: branchofficeofricksimpsonoil@gmail.com, i used the oil for a month and there was great changes. Am Antonio Benard i reside in Italy, my wife was suffering from Breast Cancer and the doctor told me that there was nothing that he could do to save my beloved wife. Then a friend told me about the Rick Simpson hemp oil that can cure cancer, i told him that my wife’s breast cancer was in the last stage that i don’t think the hemp oil would cure it and he persuaded me to try it, for the love of my wife, i decided to give it a try. I bought it and she used it,it worked exactly as the doctor prescribed it. Thanks to doctor Thomas for taking away sorrow in my life. can you all imagine, that my wife have a 6 years old daughter and a 3 years old son, what would i have done.. God will bless Rick Simpson and Dr. RICK for helping me with cannabis oil and for his support and care. contact: ricksimpsoncancercenter@outlook.com what can i say unto my LORD, all i have to say is THANK YOU LORD. Hi, It nice to inform you all that I have done Chemo and Radiation 2 times for my Breasts. My battle with Breast cancer started 5 years ago, after so many Chemo, Radiation and other natural therapy treatment that i took just to cure my Breast cancer, it all didn’t work for my condition. I have been treating this disease for the past 5 years, but today i am here telling the world about my final victory over Breast cancer with the help of Rick Simpson Hemp Oil or cannabis Oil that I bought from Dr. Rick at:ricksimpsoncancercenter@outlook.com, This is a breakthrough in my family with so much Joy in our life today, i do really appreciate all the help and contribution from every member of my family for all they did for me and much love to my caring and loving husband. My love, you gave me the strengthen. Let Stop Breast Cancer, Go for your test and save your life, but if you have any cancerous diseases, there is no need to waster money on Chemo or Radiation, go get your Rick Simpson medication from Dr. Kelvin at:ricksimpsoncancercenter@outlook.com, this is a medication that should be legalize worldwide, for those who wish to purchase the medication, just contact Dr. Rick on: ricksimpsoncancercenter@outlook.com for purchase of medication. Phoenix Tears Enlightenment Seeking for Representative in Every Country, State and City in Europe, Asia, North and South America Who will be able to handle a large quantity of Cannabis Oil Medication for patients around you who need this medication to save their life. Below are the Products that we have to ship to any important and serious representative or partner in Europe, Asia, North and South America. The Below medication has proven hundred percent assured treatment to various ailments such cancer, brain tumor, insomnia, MS, Diabetes, Lupus, Heart Diseases, Alzheimer, Tuberculosis, Trachea, Bronchus, Lung Cancers, Ischemic Heart Disease, Diarrheal Diseases, Perinatal Conditions, Chronic Obstructive Pulmonary Disease, Lower Respiratory Infections, Cerebrovascular Disease, Ischemic Heart Disease and others illness and Below are the Medication which will been successful in curing the above named ailment for over the past decades which over 695,000.00 patients cured of all forms of cancer and so many more. Stocks Available for purchase, partnership needed worldwide so that more life can be saved. My husband had stage four lung cancer has been cured within the Rick Simpson Hemp oil. My husband has been through chemo 3 times, but this time his condition was getting worse that I was afraid it will kill him. When a friend of mine directed me to Rick Simpson at: rickcannabisoil@outlook.com where I could buy the medication from, because the Rick Simpson has help cured his own Brain tumor and I strongly recommend that he would helped me with my husband cancer and cure it completely, I never believed the story, but today, with thanks giving in my heart, My husband lungs cancer has been cured within the Rick Simpson hemp oil and I want you all to join hands in appreciation of the great work that is been done by rick Simpson, he is the man that saved the life of my husband with hemp oil, thanks to him. You can contact him through his email: rickcannabisoil@outlook.com I’ll keep thanking him because he is God sent to save my family that was at the stage of collapsing all because of my husband cancer. Warm appreciation to Dr Rick Simpson for curing my Breast cancer with cannabis oil. I really appreciate your help in bring back my lost life with the help of his high quality Cannabis Oil, i am so grateful to you Dr for all the love and concern that you showed me and i would keep on giving my testimony about your Cannabis oil and how is cures Cancer within 90 days of treatment. it just like a Miracle that has happened to me with full recovery from cancer and i am free from Cancer. Thanks be to God Almighty for sending you my way Dr, i hope and know that you would keep on putting smiles on world at large with this great medication. email: drricksimpsonoil@gmail.com for all solution to cancer and other diseases. Those facing health challenges should go for cannabis oil to ensure the absolute cure of all kinds of cancerous diseases. For hopes and help, kindly contact Dr Rick Simpson for full knowledge about the medication and Services to you. Dr. email: drricksimpsonoil@gmail.com for all solution to cancer and other diseases. My name is Mrs. Carol Guthrie from USA , It is with pleasure that i thank Dr. Gerrard Milner for saving my dying husband with his cannabis oil. news that it was cancer. like the way we were treated there. We felt like cattle…just a number. I can’t believe this. A great testimony that i must share to all cancer patient in the world i never believed that their could be any complete cure for lung cancer or any cancer,i saw people’s testimony on blog sites of how Rick Simpson cannabis oil brought them back to life again. i had to try it too and you can,t believe that in just few weeks i started using it all my pains stop gradually and i had to leave without the drugs the doctor gave to me. Right now i can tell you that few months now i have not had any pain, and i have just went for text last week and the doctor confirmed that there is no trace of any cancer system. Glory be to God for leading me to this genuine to Risk Simpson. I am so happy as i am sharing this testimony. My advice to you all who thinks that their is no cure for cancer that is Not true ,just contact him and get cannabis oil from Rick Simpson to your cancer and you will be free and free for ever, Try it and you will not regret it because it truly works. One thing i have come to realize is that you never know how true it is until you try. There is no harm in trying. Remember, delay in treatment leads to death. Here is his email: ricksimpsonmedicalhome@gmail.com Contact him and be free from cancer! How amazing how these powerful herb can have the possibility of curing other disease, Its ability is no doubt effective and safe. No wonder it can be a great substitute to medicine as well. My Husband that was highly infected with colon cancer with mets to other parts of the body, he was even given 6 months to live. God, life for the family was a living hell with sorrow in the heart, but today i shouting out to the world that the cannabis oil have save my husband from dying. he is still alive and we are in the 10 months. God is so great to the Faithful. Global Green Dispensary can help you reclaim your health and quality of life. We can provide you with information pertaining to the acquisition, benefits and use of medicinal cannabis and Cannabis Oil oil. Don’t let your illness define your life. Some of the conditions cannabis oil and Medical marijuana has been used for include: Cancer, Diabetes, Crohn’s disease, Gout, Pain relief, Glaucoma, Opioid Dependence, treating Alcohol abuse, Epilepsy, Psoriasis, Asthma, Adrenal disease, Inflammatory Bowel disease, Fibromyalgia, Rheumatoid arthritis, Dravet syndrome just to name a few.Our Oil Cure s Arthritis! Snoring! Diarrhea! Acne! Diabetes! Removes warts! Mighraines! Lose weight! Alcoholism! Glaucoma! Add to the extravagant medical claims, the additional accusation that you can’t get this treatment because of a conspiracy by Big Pharmacy and greedy, grasping doctors who want people to suffer so they can charge them lots of money to fix them with agonizing tortures that don’t work. Hey! I can,t believe this. A great testimony that i must share to all cancer patient in the world i never believed that their could be any complete cure for lung cancer or any cancer,i saw people testimony on blog sites of how Dr Rick Simpson cannabis oil brought them back to life again. i had to try it too and you can,t believe that in just few weeks i started using it all my pains stop gradually and i had to leave without the drugs the doctor gave to me. Right now i can tell you that few months now i have not had any pain, and i have just went for text last week and the doctor confirmed that there is no trace of any cancer system. Glory be to God for leading me to this genuine Man Dr Rick Simpson. I am so happy as i am sharing this testimony. My advice to you all who thinks that their is no cure for cancer that is Not true ,just contact him and get cannabis oil from Dr Rick Nelson to your cancer and you will be free and free for ever, Try it and you will not regret it because it truly works. One thing i have come to realize is that you never know how true it is until you try. There is no harm in trying. Remember, delay in treatment leads to death. Here is his email:(rickcannabisoil19@gmail.com)Contact him and be free from cancer! A great testimony i must share to all cancer patient in the world i never believed that their could be any complete cure for lung cancer or any cancer,i saw people’s testimony on blog sites of how Rick Simpson cannabis oil brought them back to life again i had to try it too and you cant believe that in just few weeks i started using it all my pains stop gradually, and i had to leave without using the drugs the doctor gave to me,right now i can tell you that for months now i have never had any pain and i have just went for text and the doctor confirmed that there is no trace of any cancer again,glory be to Jesus for leading me to this genuine man called Rick Simpson, i am so happy for sharing this testimony,my advice to you people that think that their is no cure for cancer,just contact and get the oil treatment from Rick Simpson try it and you will not regret it because it truly works and here is his email(rickcannabisoil20@gmail.com) Thanks and God bless you? I suffer from Breast Cancer, which for me, is basically a Death Sentence on my life, the thoughts of having Breast Cancer burns and itches simultaneously in my heart that i was dead alive (and looks hideous). I heard that Hemp Oil could help, and for the price i was willing to try anything that would save my My Life. What I found out was astonishing! It was instantly getting better and better and most of the virus are gone and just little medication left for me. It’s also a light, i am very grateful to Dr kish for Selling the Hemp Oil for me and his Medical Advises, for all those that have problems with Cancer Please Please Kindly let the Dr kish Know at: drkish022@outlook.com .My Husband that was highly infected with cancer of the lungs, he was even given days that he would live is now as healthy as a new born chicken with the help of dr kish with his Hemp. Hey! I can,t believe this. A great testimony that i must share to all cancer patient in the world i never believed that their could be any complete cure for lung cancer or any cancer,i saw people testimony on blog sites of how Dr Rick Simpson cannabis oil brought them back to life again. i had to try it too and you can,t believe that in just few weeks i started using it all my pains stop gradually and i had to leave without the drugs the doctor gave to me. Right now i can tell you that few months now i have not had any pain, and i have just went for text last week and the doctor confirmed that there is no trace of any cancer system. Glory be to God for leading me to this genuine Man Dr Rick Simpson. I am so happy as i am sharing this testimony. My advice to you all who thinks that their is no cure for cancer that is Not true, just contact him and get cannabis oil from Dr Rick Simpson to cure your cancer and you will be free and free for ever, Try it and you will not regret it because it truly works. One thing i have come to realize is that you never know how true it is until you try. There is no harm in trying. Remember, delay in treatment leads to death. Here is his email:(rickcannabisoil19@gmail.com)Contact him and be free from cancer! Hey! I can,t believe this. A great testimony that i must share to all cancer patient in the world i never believed that their could be any complete cure for lung cancer or any cancer,i saw people testimony on blog sites of how Dr Rick Simpson cannabis oil brought them back to life again. i had to try it too and you can,t believe that in just few weeks i started using it all my pains stop gradually and i had to leave without the drugs the doctor gave to me. Right now i can tell you that few months now i have not had any pain, and i have just went for text last week and the doctor confirmed that there is no trace of any cancer system. Glory be to God for leading me to this genuine Man Dr Rick Simpson. I am so happy as i am sharing this testimony. My advice to you all who thinks that their is no cure for cancer that is Not true, just contact him and get cannabis oil from Dr Rick Simpson to cure your cancer and you will be free and free for ever, Try it and you will not regret it because it truly works. One thing i have come to realize is that you never know how true it is until you try. There is no harm in trying. Remember, delay in treatment leads to death. Here is his email:(rickcannabisoil19@gmail.com)Contact him and be free from cancer! I wish you a quick recovery. My journey with cancer began in January of 2009. Then in June of 2011 I was diagnosed with cancer. Average life expectancy is two and a half to three years. Early in the year of 2014 I was introduced to Rick Simpson hemp oil by a friend from Vancouver, Canada. Around that time I met some interesting people on facebook who had a lot to say about cannabis oil curing cancer, The testimonials of people who have been cured were incredible. I can’t mention names, but I wrote on the wall of one of the groups that are fighting to legalize cannabis, asking if anyone knew where I could get my hands on some cannabis oil. A few days later the universe hooked me up with just the right person – the medication was procured and delivered to me within 2 days. Rick Simpson has been providing people with instructions on how to make Hemp Oil medicines for about 8 years. Cannabis is very strong and the idea is to build up the daily dose over time. One dose is a drop on your finger about the size of “half a grain of rice”. Since that August in 2014, Shirley’s had no sign of cancer. I feel strong, brave, invincible…and I’m so loved…that’s worth staying for, I would say! Rick Simpson have proven that properly made hemp medicine provides relief and cures many diseases such as; liver failure, Stroke, Fibroids, Heart Disease, Hepatitis, Epilepsy, Fetal Alcohol Spectrum Disorders, Asthma, HIV/AIDS, Kidney Disease,(Chronic Kidney Disease), cancer and many more. Simpson has provided hemp oil to hundreds of people with various medical conditions and the results speak for themselves. The procurement is free because he said he does not produce it for sale rather he produce it to save life of people having cancer problem in the world. All i pay for was the delivery charges to deliver the medication to my door step thanks to God and Dr Rick Simpson for my health again. please share with others and save a life today God bless you!